After taking a short break from blogging (only two weeks I think?) I'm back and ready to roll! Unlike most normal people my holidays were full to the brim of things to do every single day, not much relax time. Leave it up to me to make myself busier than when I was actually studying! 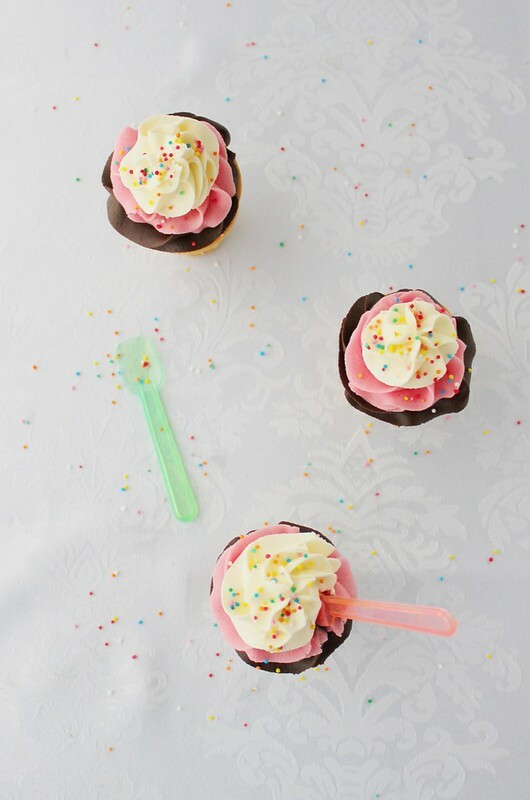 Aside from working two days a week at my job teaching preschool children, I did some baking and photography for the lovely team at Love Cake which you'll see more of in the next few weeks. I also managed to re-photograph (which means re-making) a few of my old favourite recipes like the Chocolate Cloud Cake, Apricot Fudge Slice and Cinnamon Pinwheel Buns. I think I forgot to mention I gained about 3kgs too. Not a highlight of the holidays. I made a pretty cool cake to say thank you to my team at work, helping me get through one year of study. Can't wait to share that one with you too! 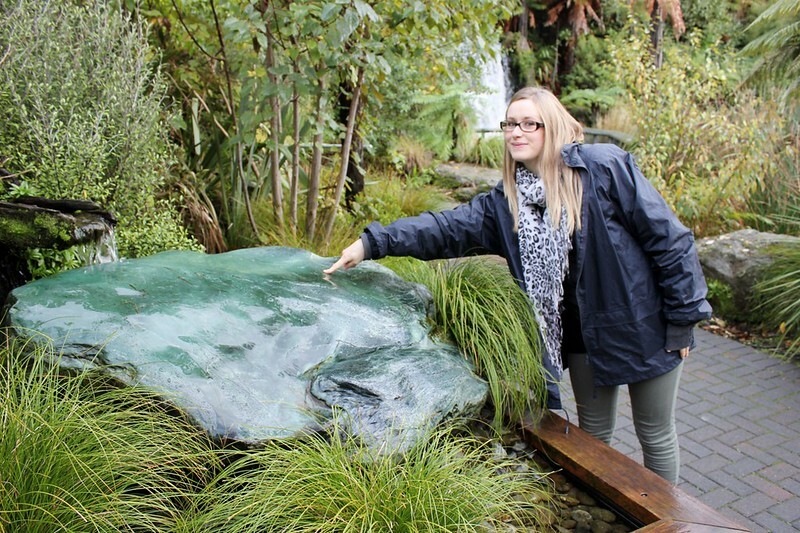 Mr S and I took a two day trip down to Rotorua where we visited Rainbow Springs and had some well deserved down time. Lastly, I had my niece, Cleo, over to hang out with me and do some baking. Because baking is pretty much "our thing" when she visits. Last time she helped me make Cookie Monster Cupcakes. 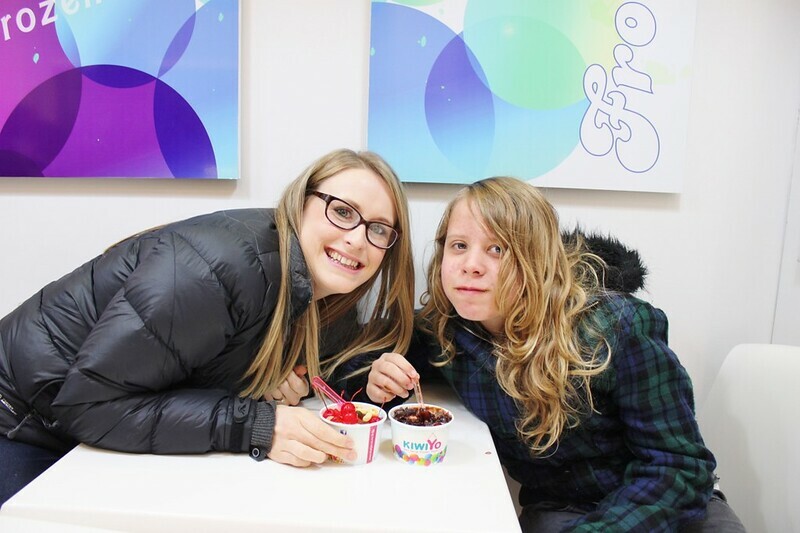 We also visited Kiwiyo because in my opinion, if you are a kid (or a big kid like me) and you haven't tried self-service frozen yoghurt with crazy cool toppings of your choice, you are deprived. So she also got her chocolate fix. 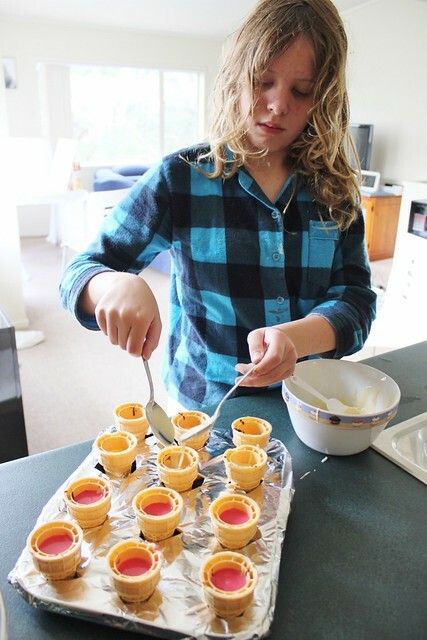 Probably a silly choice for dessert as it kept her up all night, but I'm not the mum, I'm the cool Aunty! All in all it was a nice, although not overly relaxing, holiday. 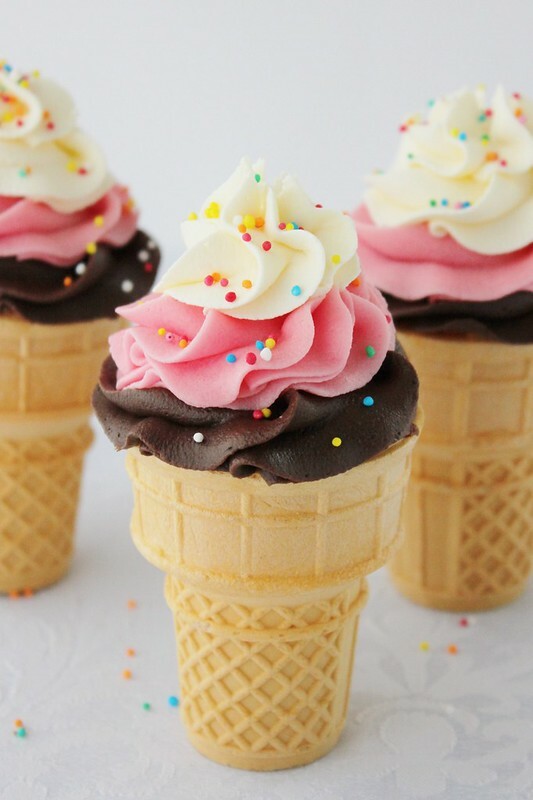 Cleo and I decided on making ice cream cone cupcakes. I wasn't sure whether to share this recipe with everyone because frankly, they didn't work out that well. 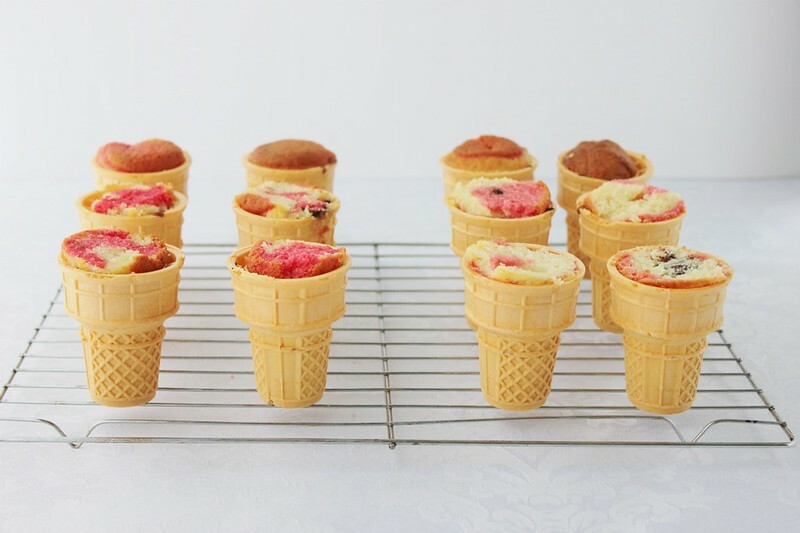 The idea is that you make a cupcake batter, fill an ice cream cone 3/4 full with it and bake it as you normally would. Well when we did that we got volcanoes. Not pretty. We were so disappointed (okay I was more disappointed than Cleo) so I quickly whipped up another batch and tried it again making sure to only fill the cases half full. Then they did the same thing. So I am sharing my experience in the hopes that you may have some tips for me. 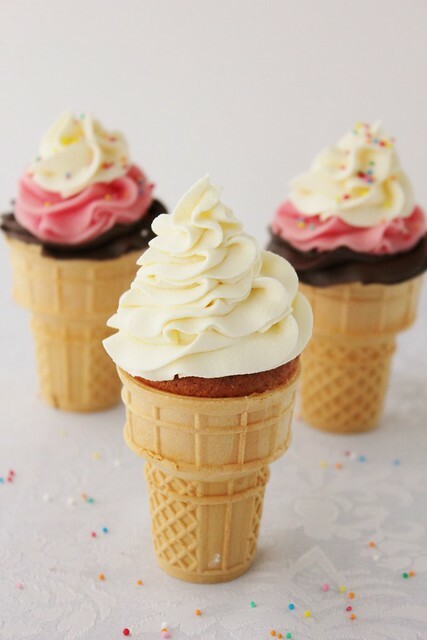 Perhaps it was my choice of cone (that's what I'm going with) or perhaps it was the cake batter or perhaps the cake gods weren't with me this time. I'm sure you guys will know better than me! 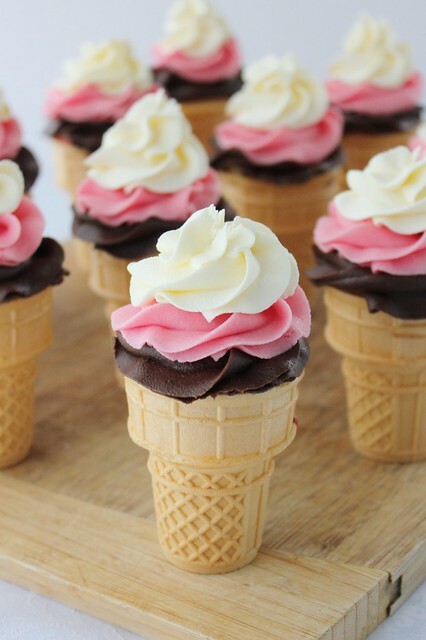 All I know is that they looked cute and tasted good, so up on the blog they go! Separate your batter evenly between three separate bowls. 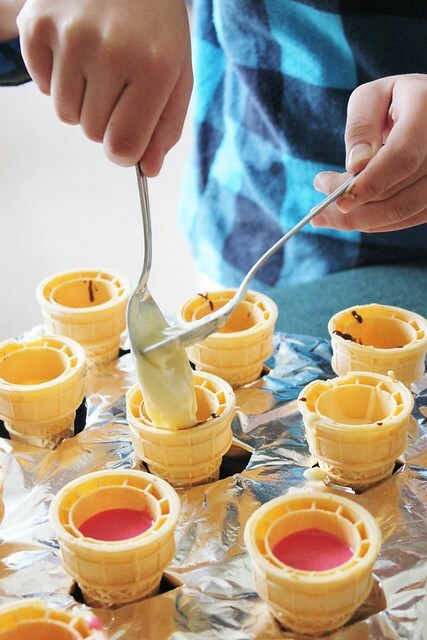 In one of the bowls add the strawberry essence and food colouring and mix well to incorporate it. In the next bowl, sift the cocoa into the mixture and mix well until well incorporated. 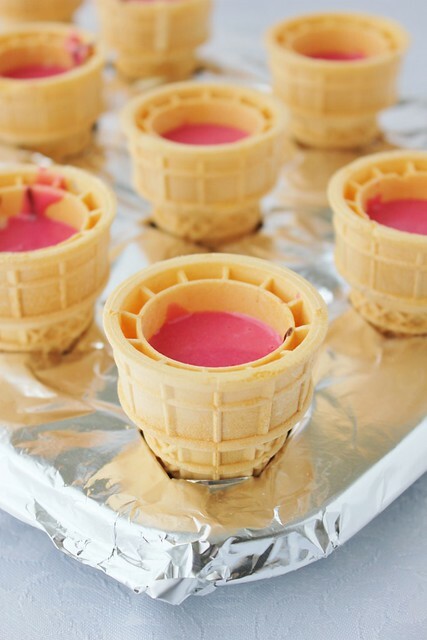 Spread foil over a muffin tin and poke holes in each section. 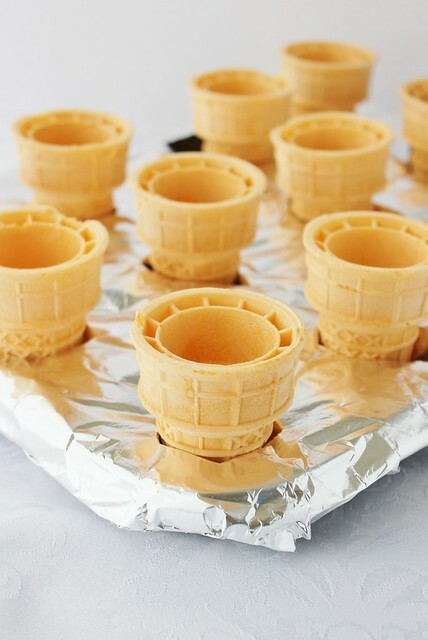 Gently press the ice cream cones into each hole. 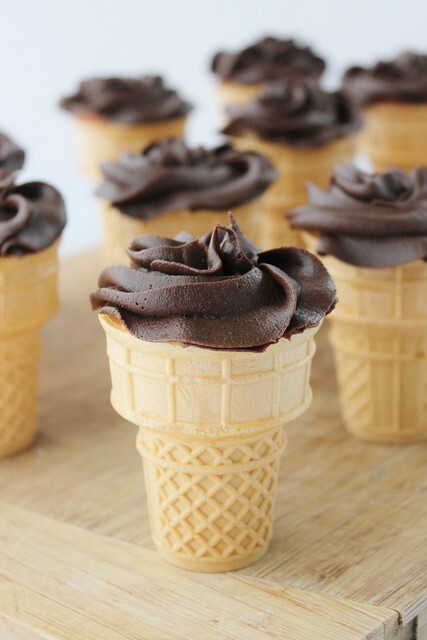 Using two teaspoons, carefully drop two heaped spoonfuls of mixture of each batter into the cones, starting with the cocoa, then the vanilla and ending with the strawberry. Bake in the oven for the time suggested on your recipe (about 10-15 minutes). 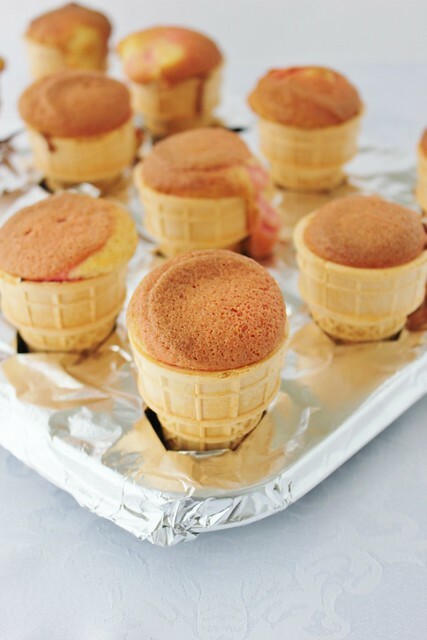 When cupcakes are baked through remove from the oven and press a fork into the bottom of each cone to help stop the cones going soft (they will still be slightly soft). Leave to cool completely on a cooling rack before decorating. 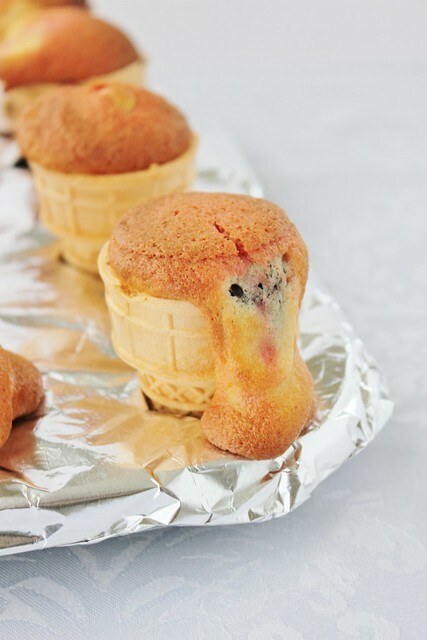 If cupcakes have spilled over during cooking scrape off sides and cut the tops off to create an even surface for decorating. Add vanilla and mix until well incorporated. Sift icing sugar into a large bowl and gradually add to the butter one cup at a time. When mixture becomes too lumpy and dry add 1 tablespoon of milk. When all of the icing sugar has been added beat on a medium/high speed for approx. 2 minutes. Divide mixture evenly between three bowls. 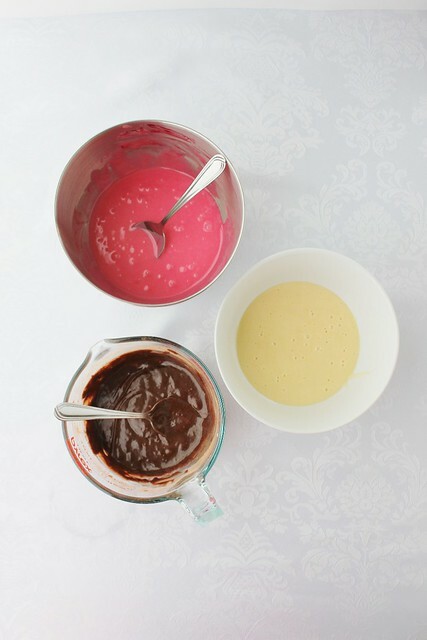 In one bowl add the strawberry essence and food colouring and mix until well incorporated. In the next bowl, sift in the cocoa and mix until well incorporated, you may need to add some more milk to the mixture if it gets too lumpy and dry. 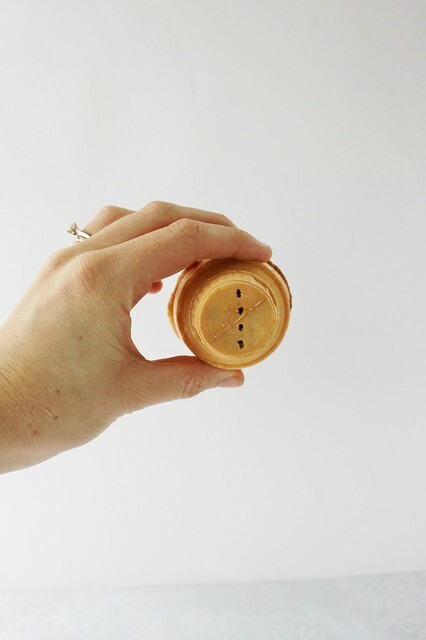 Using the 1M tip or a large star tip, pipe chocolate swirls on each cupcake starting on the outside and working your way in. 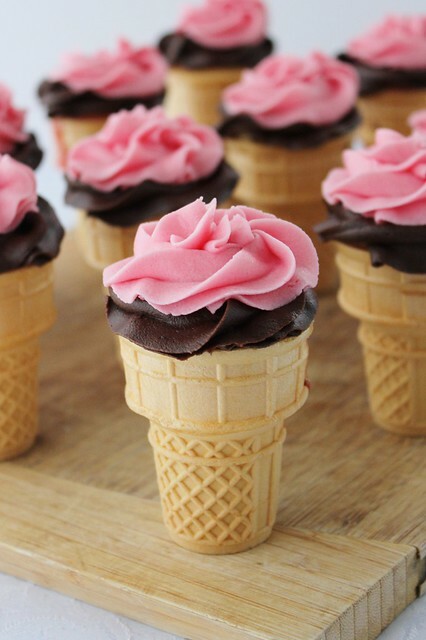 Repeat the process with the strawberry icing, this goes directly on top of the chocolate icing. Finish off the decorating with any extras you like, sprinkles, Flake chocolate bars, a cherry on top etc. If you have any ideas as to why my cupcakes overflowed both times please do let me know, either in the comments section below or feel free to message me on Facebook or Twitter. I'm back to my normal "busy" life as of tomorrow. Who knows what study has in store for me in year TWO. Scary thought. Wish me luck! They are SO gorgeous, Lydia!! Love them!! These are fabulous! I will have to try them too.... Half full! 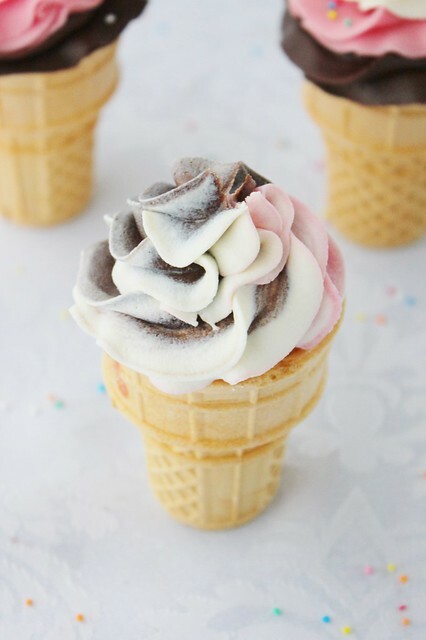 What are the holes or dots on the bottom of the cone? 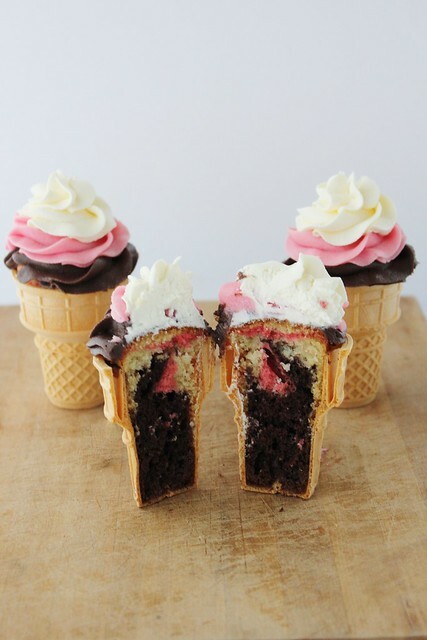 I want to make these for a birthday party. Thanks! Die sehen ja sehr lecker aus.